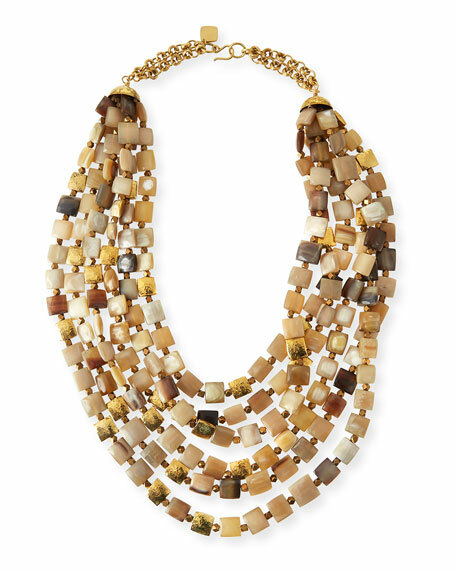 Kila multi-strand necklace by Ashley Pittman. 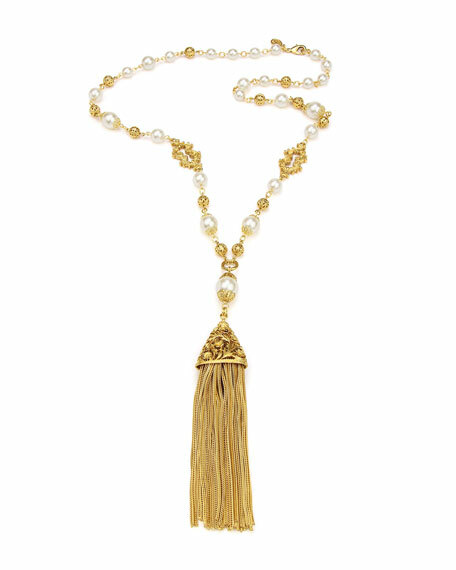 Light horn with bronze bead accents. 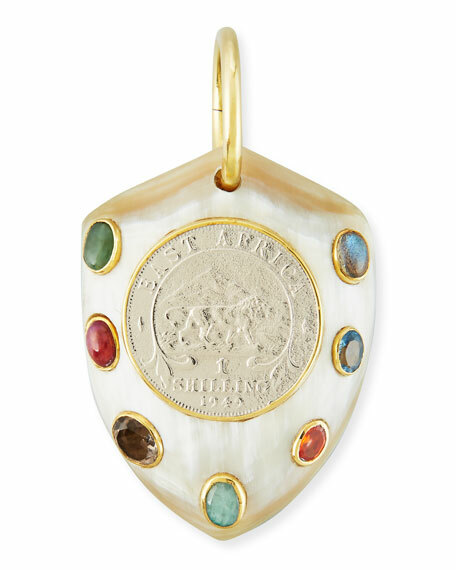 The Ashley Pittman Collection reinterprets the power and simplicity expressed in the shapes and textures of centuries-old African jewelry. 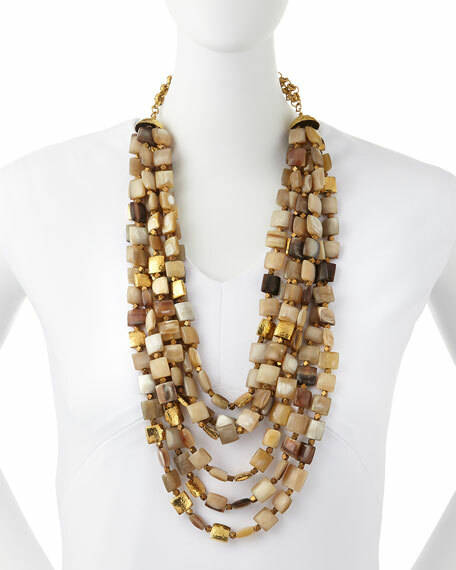 Each piece is entirely handcrafted in Kenya featuring re-purposed horn semiprecious gemstones, bronze and materials indigenous to East Africa. For in-store inquiries, use sku #282144. 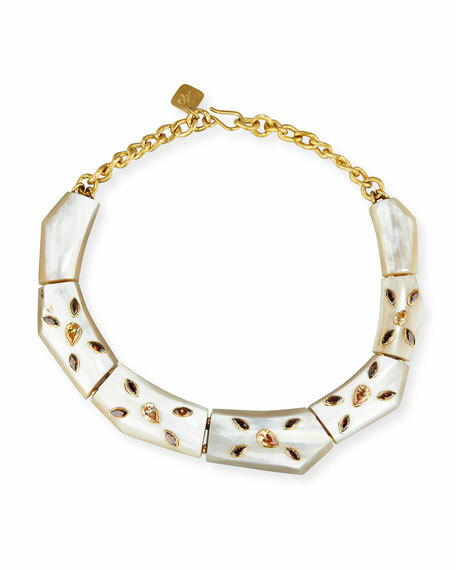 Ashley Pittman "Malkia" necklace. Polished bronze hardware. Carved, angular light horn stations. Marquis and tear-shaped bezel-set orange zircon and whiskey quartz accents. Petite rondelle spacer beads. Approx. 11"L; 5.5"L drop. Hook clasp with logo charm. Handcrafted in Kenya. Brunello Cucinelli dress in cotton poplin. Crew neckline. Cap sleeves. D-ring belted at waist. Sarong-style wrap front. Sheath silhouette. Midi length. Cotton/nylon. Made in Italy. Model's measurements: Height 5'11"/180cm, bust 32"/81cm, waist 24"/61cm, hips 35"/89cm, dress size US 2.